Undercarriage collapsed on the left side on landing. Skidded and stopped on the grass next to the runway. 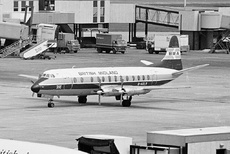 According to a contemporary report ("Yorkshire Air News", March 1973): "The British Midland Viscount which crashed at Elmdon on 19th January was G-AZLR. It was flown back to Castle Donington a week later on 26th January, not being extensively damaged"
Returned to service by 26 March 1974, and stayed in serivce until 7 May 1986.